Today, Gartner published the annual Magic Quadrant for General-Purpose Disk Arrays, and INFINIDAT has moved higher in ability to execute and further in completeness of vision. We think this is a solid milestone in a great string of achievements this year, including our $95 million Series C investment in October, which recognize our success in building a profitable business that delivers a better answer to enterprise storage challenges than all-flash, software-defined storage, or hyper-converged infrastructure. 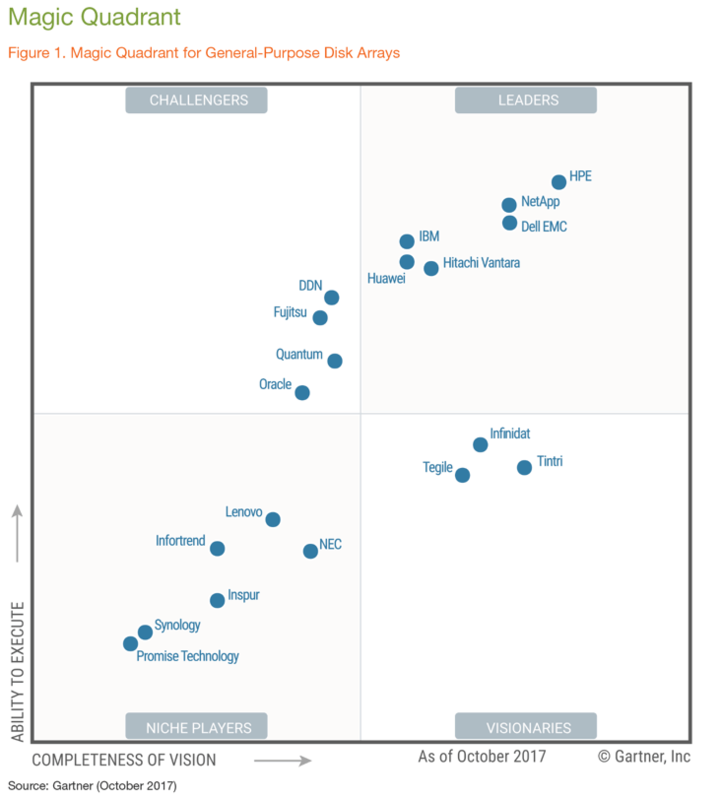 Click here to download a copy of the full Magic Quadrant for General-Purpose Disk Arrays report. We don’t disclose revenue – even to Gartner – but we believe our incredible triple-digit growth to over 2 exabytes of deployed capacity has helped improve our positioning as a Visionary, based on both completeness of vision and ability to execute. Thanks to our customers most of all for recognizing the value that we provide and powering that growth. We know that it’s not easy for Gartner – or anyone – to build a level playing field that effectively compares such a broad ecosystem of storage vendors. So there are naturally some limitations in the Magic Quadrant analysis. Specifically, we think it’s important for clients to consider features and capabilities that may be aligned to their purchasing timeframes but miss the Magic Quadrant cutoff dates. After you read the Magic Quadrant commentary, be sure to talk to your INFINIDAT representatives about the capabilities Gartner wasn’t able to cover this time around, and what’s around the corner. And if you aren’t already a Gartner subscriber, but want to hear their perspective at a deeper level, we’re happy to help you set up inquiries. We believe that more information and transparency is always a good thing for clients. INFINIDAT is not a conventional storage company. We appreciate Gartner’s acknowledgment and believe our position further validates our unique approach. This graphic was published by Gartner, Inc. as part of a larger research document and should be evaluated in the context of the entire document. The Gartner document is available upon request from http://info.infinidat.com/gartner_magic_quadrant_report.html?source=Web.